RICHMOND, Va., March 21, 2019 /PRNewswire/ -- Longhorn Moist Snuff, a leader in quality, convenience and value, launched its Savings Made Real Sweepstakes running from March 11 to June 30 with hundreds of prizes available for consumers, including a $25,000 grand prize. 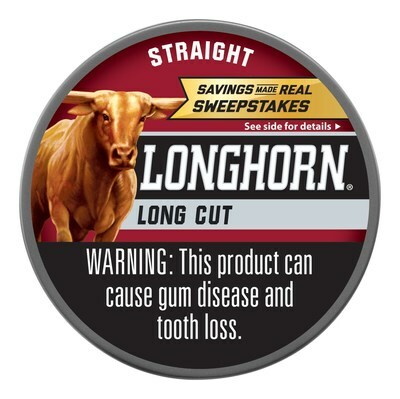 Participants can enter the sweepstakes by visiting Longhornsnuff.com and following the link to the Sweepstakes page where the Savings Realizer tool demonstrates how much money can be saved on moist snuff purchases by switching to Longhorn. Consumers can enter once per day and get bonus entries for sharing what they would do with $25,000 if they won the grand prize. "For years, people have been saving money without sacrificing quality by purchasing Longhorn," said Tracy Vernon, Associate Brand Manager at Swedish Match. "Now, they have the chance to win it, too. We have hundreds of prizes to award over the next sixteen weeks and can't wait to give them away while demonstrating Longhorn's value." Customers that use the Savings Realizer tool not only see what they can save, but also get suggestions on what they can do with their savings. Participants simply need to enter the state they live in, number of moist snuff cans used per week, brand most often purchased and a time frame to generate their potential savings. In addition to the $25,000 grand prize, the Savings Made Real Sweepstakes include four monthly prizes, ranging from outdoor furniture upgrades to a 65" 4K HD TV, sound system, leather recliner and chiller. Sixteen weekly prizes and 560 daily prizes will also be awarded. No purchase necessary. Void in MA, MI, VA and where prohibited. Open only to legal residents of, and currently residing in, the 50 U.S. and D.C. (excluding residents of MA, MI and VA), who are tobacco consumers, 21 & older. Begins at 12:00 PM ET on 3/11/19 and ends at 3:00 PM ET on 6/30/19. The Longhorn Savings Made Real Sweepstakes is sponsored by Pinkerton Tobacco Co. LP. For Official Rules, visit www.Longhornsnuff.com.